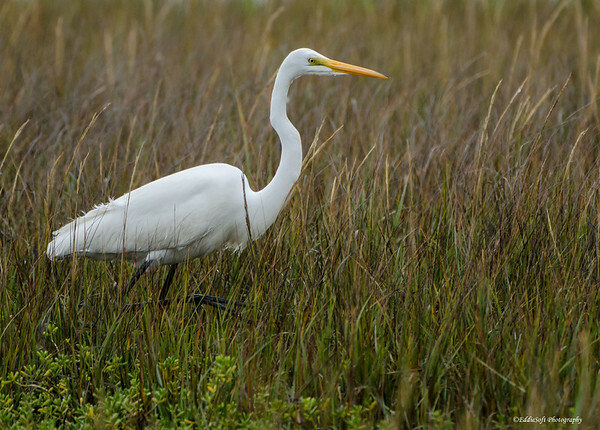 Obviously the Great Egret is not a new bird on my list – it appeared on Life Intrigued way back in 2011 (link here). The best thing about the hobby of bird photography is even though you have a bird on your list already … you can always try to improve your shots. Maybe you can get it in a new setting, displaying some new behavior or maybe just improve on the technicals of taking a photograph. With the exception of those damn Coots, I’ll still take shots of whatever I see that has feathers. Just so happens that the Great’s are a lot easier to see (ha). 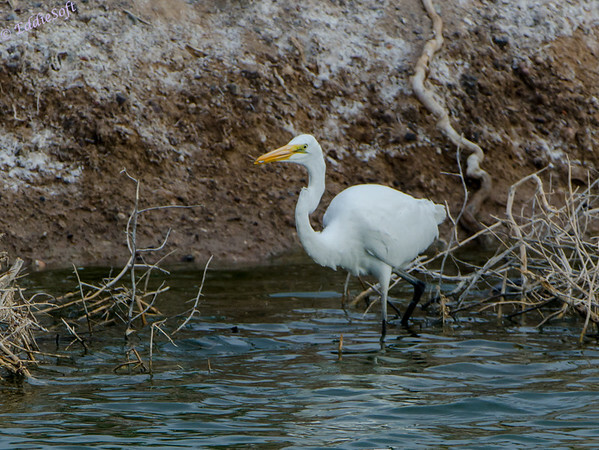 Hit the jump to see a couple more pictures of this long necked member of the Egret family. I bet you were all ready to read a post about our recent vacation. Unfortunately, I am generally behind on my vacation pictures and if I recall correctly I have not even posted any shots from our Zion trip other than the Phoadtography set (link here). It would be cruel to make you wait until I get completely caught up, but at least allow me the liberty of getting a few of the posts out before deluging you with a gadzillion pictures from our latest trek to the West. Although, I could just be buying some time to get through tagging and filtering all those images, but I’ll never tell… to the post! If you recall, we took a ride up North so our poodles could compete in the TDAA Nationals (link here). The “Linda” part of that sentence was changed to “we” due to all out bribery. Linda knows I enjoy visiting the Chain O’ Lakes State Park mostly due to the opportunity to see Sandhill Cranes again (link here) and was quick to remind me that the park was on the way. Couple that with a promised stop at the Anderson’s Candy store and there was no hope for resistance. Alas, there were no Sandhill Cranes to be seen anywhere in the park (this is where you shed a tear for my heartbreak… I’ll wait). Come on, pull yourself together, the trip turned out very fruitful. On our way out of the park, I was keeping my eyes focused on the field where the cranes were hanging out the last time. Disappointed at the lack of birds I started to turn back in my seat. That is when a a white spot caught my eye way off in the trees. I yelled out our secret code word for “Stop the car, there is some kind of animal out there that Brian must have a picture of”. The code word is short and sweet to help cut down on the ear to brake response – no, I will not reveal the code word but for effect it isn’t one you would not use in other company. Linda put the car in reverse and rolled back a little to the observation spot. It was definitely white and definitely sitting in a tree, but exactly what it was remained a mystery. Time to bring out the Beast! 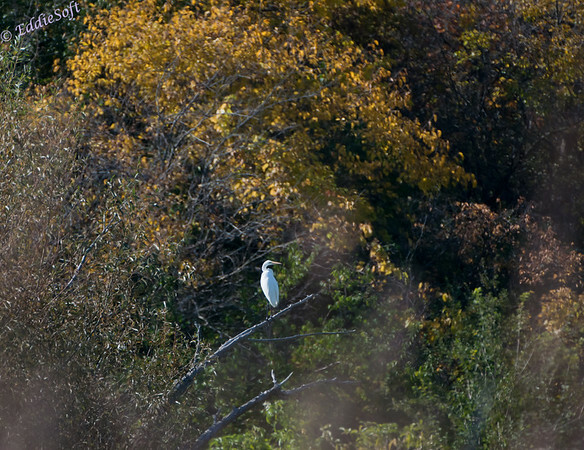 The viewfinder revealed that it was a White Egret. 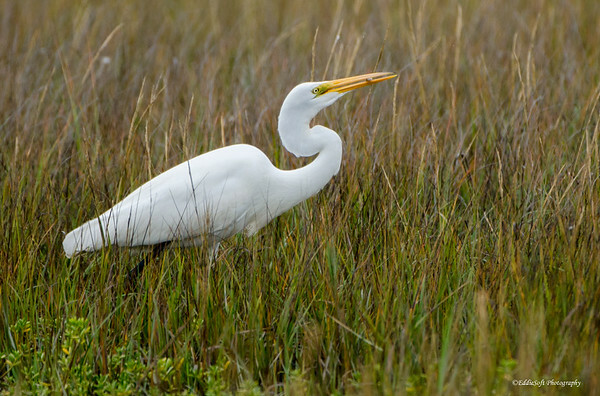 Well, that is what I have always called it, apparently it is now just referred to as the Great Egret. Here is my initial shot giving an impression of how far off it was even with the help of the glass – remember, the Beast goes out 400. The sight line went through a series of trees causing the leaf splotches. Once again, this park had come through. 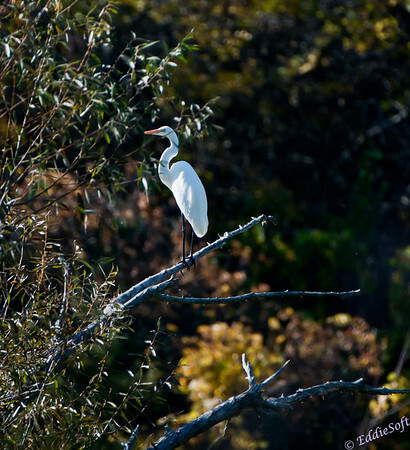 This was the first White errr Great Egret I have been able to photograph and therefore another check on my Bird List. This distance just wasn’t going to do for this opportunity. Time to go cross country. You cannot tell from these shots, but there was a large field in front of his perch that appeared to be thick prairie grass browned from the coming Fall. Two steps later it was revealed that it was not really prairie grass, but more like cattail stalks growing up in the middle of a swamp. My wet shoe and sock was a proof enough. Crap! Out came the cell, a quick call back to Linda (she had driven off to find a pull off) and on came the hiking shoes. Once again I was off to get the shot. 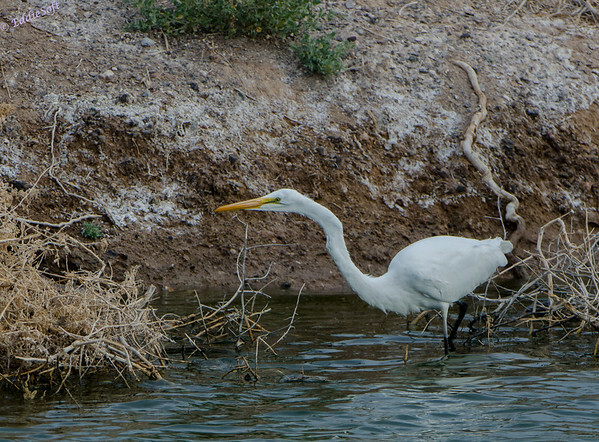 Without a doubt, this was great entertainment for the egret. 15 minutes later I was standing in the middle of the swamp trying to find an adequately firm spot to put the tripod. Still not as close as I wanted to be, but navigating much further was going to require some serious rubber boots and the nerves were a little frayed at the though of water snakes closing in for the kill. 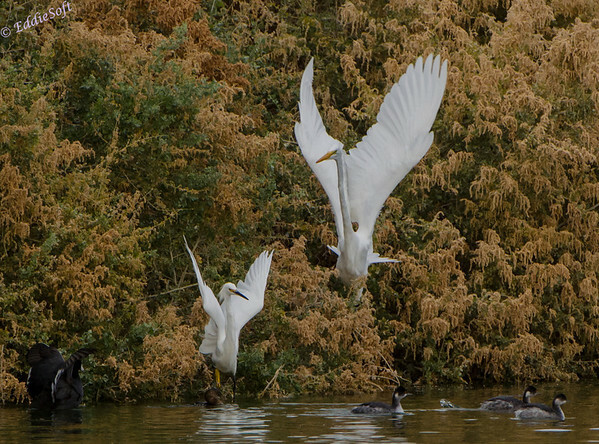 Hit the jump to see the rest of the Great Egret pictures!